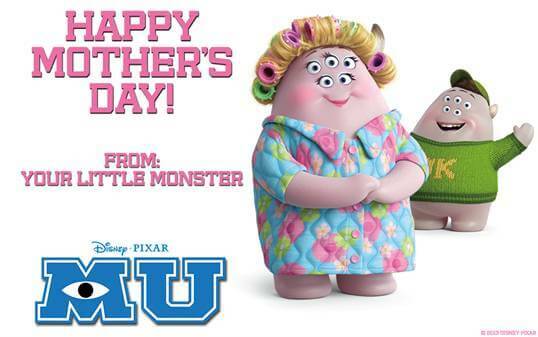 An Adorable Happy Mother's Day from Monsters University! An Adorable Happy Mother’s Day from Monsters University! I love this fun graphic celebrating Mother's Day! Disney, Monsters University and I want to wish all the amazing moms and moms-to-be out there a very Happy Mother's Day. I hope you had a great day! Monster’s University, the prequel to Monsters, Inc. will open in theaters on June 21, 2013! Stay on top of all the Monster news when you LIKE Monster’s University on Facebook and follow Disney Pixar on Twitter! Mike Wazowski and James Sullivan are an inseparable pair now, but that wasn’t always the case. From the moment these two mismatched monsters met they couldn’t stand each other. Ever since college-bound Mike Wazowski (voice of Billy Crystal) was a little monster, he has dreamed of becoming a Scarer—and he knows better than anyone that the best Scarers come from Monsters University (MU). But during his first semester at MU, Mike’s plans are derailed when he crosses paths with hotshot James P. Sullivan,“Sulley” (voice of John Goodman), a natural-born Scarer. The pair’s out-of-control competitive spirit gets them both kicked out of the University’s elite Scare Program. To make matters worse, they realize they will have to work together, along with an odd bunch of misfit monsters, if they ever hope to make things right.“Monsters University” unlocks the door to how Mike and Sulley overcame their differences and became the best of friends. Screaming with laughter and fun, Monsters University is directed by Dan Scanlon (Cars, Mater and the Ghostlight, Tracy) and produced by Kori Rae (Up, The Incredibles, Monsters, Inc.). Monsters, Inc. was nominated for four Oscars: Best Animated Feature Film, Best Original Score, Best Sound Editing and won an Oscar for Best Original Song:If I Didn’t Have You. Oh, that’s so very cute! Happy Mother’s Day to you, too!